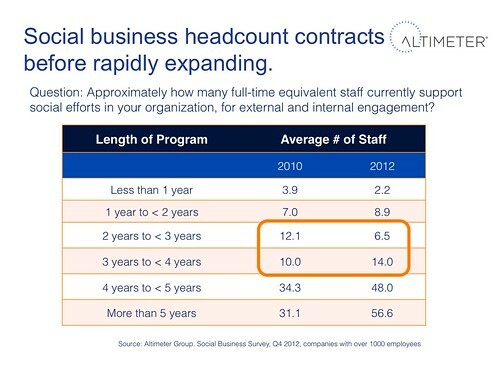 Above Image: Headcount of social business (circled in orange) slightly decreases before large growth. Like the calm before the storm, your social business headcount is likely to decrease 10-20% before it radically expands. Altimeter found through two independent surveys to enterprise class (Companies with over 1000 employees) survey respondents in different years that they both have a drop off in headcount at year 2-4. We’ve survey corporations both in 2010, as well as in Q4 2012 to find out how social business programs are structured. Much of the research was recently published in the report, the Evolution of Social Business. So why this change? After experimentation, unchecked programs get sanitized as a central body takes control. Many companies I’ve seen inside of have often experimental programs occurring for the first 1-3 years. Labeled skunkworks, rogue, or sandbox programs, this “wild west” grows out of control, sometimes causing stress or resulting in a social media crises. Often corporate communications, marketing, blessed by an executive sponsor seeks to wrangle control of these programs, by anointing a working team to build a strategy. In short, the wild wild west moves from unchecked teams in outposts to a new centralized model. A core team consolidates, finds efficiencies in a hub and spoke model. We often see companies emerge in a hub and spoke model, where a core team is serving the rest of the company in a coordinated fashion. This leader, the Corporate Social Strategist, leads the charge, often reducing excess headcount deploying social and along with it, rogue efforts. Interestingly, the data shows this happening in the 2010 early market at year 3-4. Yet fast forward two years to 2012 and we see the consolidation happen much earlier, in years 2-3, as companies have gotten wiser from their peers. Explosive growth occurs as team scales in “dandelion”, multiple hub and spoke model. After the consolidation occurs in both program strategy and the headcount as illustrated in the above diagram, companies see explosive growth as the company “gets the social religion”. If the core team has structured their program up for scale, they will have invested in social readiness, as well as have a strategy to avoid massive proliferation. Social business follows a cycle expansion, contraction, then explosion before maturity. Two data distinct data sets helped to tell this story. Expect to see social business programs hit maturity to consistently spread across the enterprise in a safe manner after 5-6 years with proper care and planning. Watch the patterns in your company, after rapid consolidation and program efficiency occurs, be prepared for radical growth as the rest of the enterprise business groups start to adopt social, including their own social leaders in business lines, departments, geographies and product units.